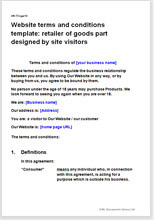 This website terms and conditions template has been written for online shops that sell products where part of the design is contributed by visitors or customers. For example, site visitors may contribute their own artwork to be printed on products. It is easy to adapt to suit your own business. The terms and conditions in this template are suitable for an online retailer that sells products that have had design input from web site visitors. The retailer is likely to buy or manufacture "white label" products then enhance them with designs suggested by visitors. The products could be anything: from prints of artwork to clothing to laptop covers. In these T&C, the incentive for the designer to submit his designs is his satisfaction that his design is being used. Because of technical legal reasons relating to consumer law we have not included options where free products are given in return, or where a royalty fee is paid. However, any business orientated retailer who isn't too worried about the technical application of the law could bend the rules, for example, by occasionally sending samples without notice to 'product testers' who happen to have part designed a product.